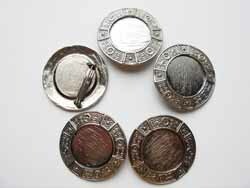 These unusual modern brooches are perfect for using with polymer clay, paint, resins/epoxy and already have a 1-1/8" pin back attached to them. 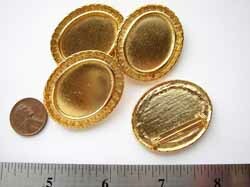 They are 3-1/4 (82.55mm) wide, 1-1/16"(27.18mm) high and with the pin back included they are 3/8" thick. These unusual modern brooches are perfect for using with polymer clay or resin and already have a 1 1/8" pin back attached to them. 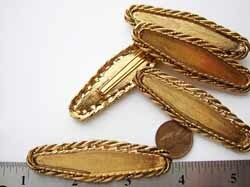 They are 3-1/4" (82.55mm) wide, 1-1/16"(27.18mm) high and 1/8" (3.3mm) thick, with the pin back included they are 3/8" thick. 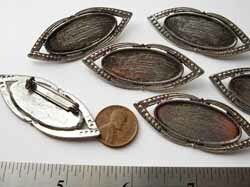 Egyptian Eye shaped brooch with 1" pin back attached. Inside dimensions 38mm (approx 1-1/2") x 17mm (approx 5/8"). Outside dimensions 2-1/4"wide, 7/8" high, and with the pin back included it is 5/16" thick. Inside deminsions 38mm (approx 1 1/2") x 17mm (approx 5/8"). Outside deminsions 2 1/4"wide, 7/8" high, and less than a 1/8" thick, with the pin back included it is 5/16" thick. 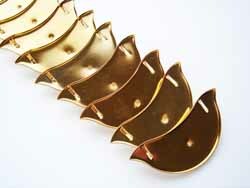 Bright gold tone finish , 1" pin back attached on the back. 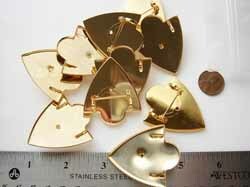 The pin back can easily be removed with cutters and the findings can then be used for doll house mirrors. 9/16" wide by 1-5/16" high and a little over 3mm thick. If you include the pin back it is 5/16" thick. 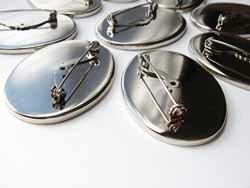 Bright silver tone finish , 1" pin back attached on the back. 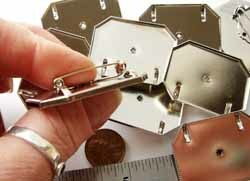 The pin back can easily be removed with cutters and the findings can then be used for doll house picture frames. 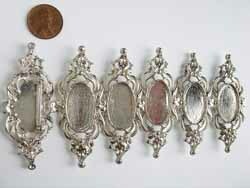 These brooches have two cells for filling with art, 1 large one and on small accent one on the upper right. 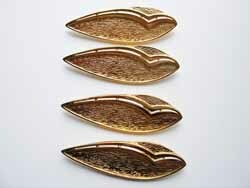 They have bright gold plate with two small cells at the ends for more clay or resin accents. Or maybe even a small rhinestone of some sort. 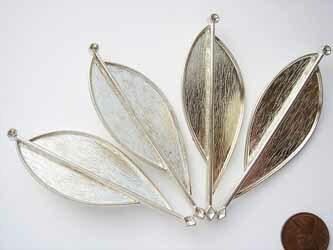 They have bright silver plate with two small cells at the ends for more clay or resin accents. Or maybe even a small rhinestone of some sort. 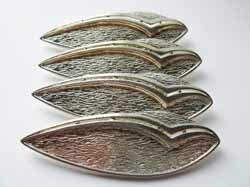 Shield brooch Silver Tone and antiqued. 1-5/8" wide, 1-9/16" high including the pin back are 5/16" thick. There nice knurled edge going around the indented edge. A thin well 1" in diameter or indentation. 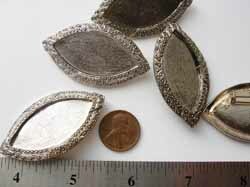 The brooch is 1-9/16" in diameter. 5/16" thick including the 1" pin back. 2-1/16” wide, 1-1/8” high including the 1-3/16”pin back, it is 5/16” thick. 2-1/16" wide, 1 1/8" high including the 1-3/16" pin back, it is 5/16" thick. We call them pickles, they sort of look like that, right? 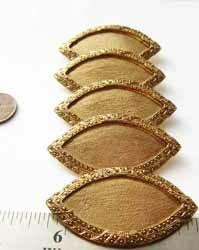 They are 2-11/16" wide, 3/4" high and including the pin back they are 3/8" thick. 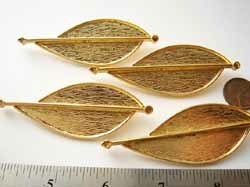 The attached pinback is 1-7/16" long. There is a beautiful braid going around the indented well where you can place clay or pour resin, make a beaded cabochon or a needle pointed one. There is an oval well in the center. 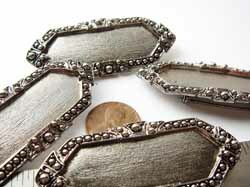 It is 15/16" wide and 9/16" high.They are beautiful bright silver tone and have a 1" pin back attached to the back. 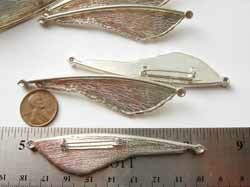 A delicate little brooch that is 1-7/8" in width, 5/8" High and 3/8" thick including the 1" pin back. 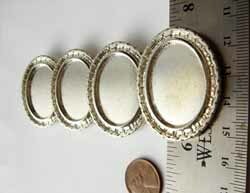 The width of the inner well is about 7/8" in width and 3/8" tall. Nice antiqued finish with a 1-7/16" pin back attached on the back. 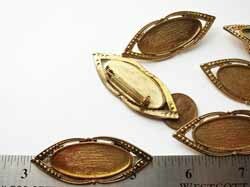 The brooch is 2-7/16" wide and 1" high. It is 3/8" thick with the pin back. 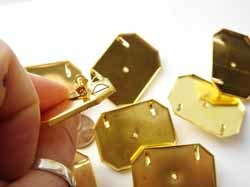 There are also 2 small holes in the design at the ends where chains could be attached if you wish. You can see it right at the tip. Frenchy Silver Tone with the scrolls and crown like top. There is a little loop at the bottom for hanging something like a drop or teardrop pearl. 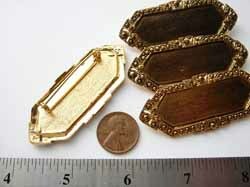 The brooch is 2-3/8" wide, 1-1/2" high, and a 1-3/16 pin back making it 5/16" thick. Frenchy Gold Tone with the scrolls and crown like top. 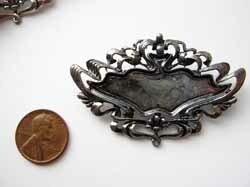 The brooch is 2-3/8" wide, 1 1/2" high, and a 1-3/16 pin back making it 5/16" thick. 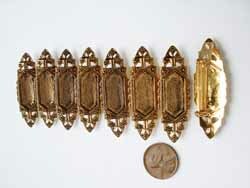 The brooch is 2-3/16" wide, 1-1/4" high, and with the 1-3/8" pin back it is 7/16" thick. The area to work in is about 1" High and 1 1/2" wide. 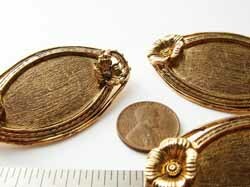 The brooch is 2-3/16" wide, 1-1/4"high, and with the 1-3/8" pin back it is 7/16" thick. The area to work in is about 1" High and 1-1/2" wide. 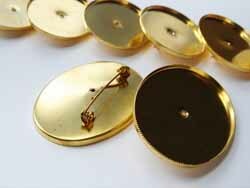 Pressed, bright gold tone finish, and have bails and a pin back on the back. 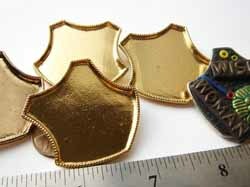 The pin back is 1"
The brooch can be also used as a cutter for the shield shape. Bake polymer clay in the brooch, pop out when cool, and glue with epoxy or the glue of your choice. Holes where the bails are made have to be plugged before using resin. 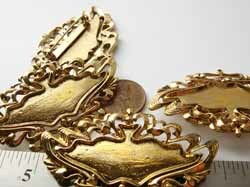 Brooch can also be turned upside down with chains and beads hanging from bails. 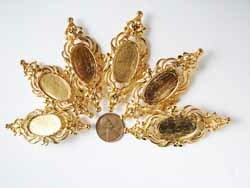 This Brooch is 1-13/16" high and 1-9/16" wide. Include the pin back it is 5/16" thick. 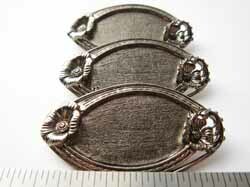 2-3/4" wide, 1-3/16" tall in the center, and 1/8" or 3mm thick. 1-1/4" pin back on the back. 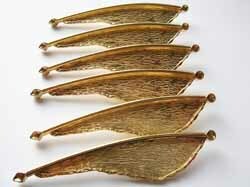 There are also 2 bails on the back so that these can be converted in to necklaces or chains can be dangled from them. Marie Segal's Production Treasures ! All rights reserved by Clay Factory, Inc©1997-2011.